- All Carbon Steels, All Stainless Steels, Alloy 20, Hastalloy, and Incoloy. - Piping systems include but are not limited to: Welded, Threaded, SS/Copper press connected, PVC/CPVC, Compression, Sweat/Braze copper and brass, FRP, and client specified upon request. Central to Dilling’s industrial services are the many details that contribute to our Code Welding capabilities. Welds on high pressure pipes, pressure vessels, and boilers must be performed correctly to avoid catastrophic failures. Dilling’s industrial clients across the United States depend on our solid reputation to know what is required and ensure that all code welding is properly planned, performed by certified personnel, supervised by American Welding Society (AWS) Certified Welding Inspectors (CWI’s), and properly documented with established Quality Assurance / Quality Control (QA/QC) methods. Specific industry certifications or “stamps” are required to perform Code Welding. Dilling Group, Inc. possesses and maintains “R”, “PP”, and “U” stamps. “R” Stamp – Dilling Group, Inc. is certified to conduct boiler and pressure vessel repairs and alterations, which are governed by the National Board of Boiler and Pressure Vessel Inspectors (NBBI) and the American Society of Mechanical Engineers (ASME) under a classification called R Stamp welding. In order to perform R Stamp welds and repairs on pressure vessels like boilers, welders are tested and certified in the quality and integrity of their weld joints through rigorous and specific testing procedures. “PP” Stamp – Dilling Group, Inc. is also certified to perform the welding, fitting, and installing of pipes and accessories that attach to pressure vessels under a classification called PP Stamp welding. This PP (Power Piping) Stamp is governed by ASME Code Section B31.1 and also requires rigorous testing and certification of welding personnel and the procedures they use to perform the welds they produce. “U” Stamp – Dilling Group, Inc. is also certified to manufacture unfired pressure vessels and has been awarded the ASME “U” Stamp for this certification. "S" Stamp - Dilling Group, Inc. is also certified for the manufacture and assembly of power boilers. Dilling Group, Inc. also performs many welding processes in industrial settings that are also governed by ASME Code, but don’t require specialized stamps. A common example of this type of welding is “Process Piping” governed by ASME Code Section B31.3 that does not require a Code Stamp. The Welding Procedures and Welders must still be qualified to ASME or other applicable requirements. 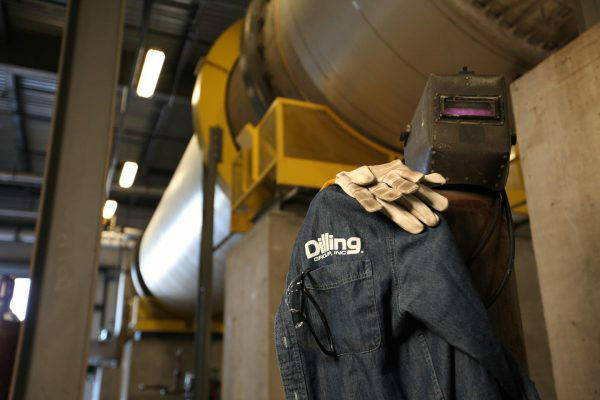 Process piping fabrication and installation is a core competency of Dilling Group, Inc.
Dilling Group staff includes Certified Welding Inspectors (CWI’s) Visual Inspectors, and personnel certified by the American Society of Nondestructive Testing (ASNT). Weld mapping documentation and 3rd party NDE testing, among various other Quality Documentation is available when specified by scope of work. Dilling also has staff P.E.’s (Professional Engineers), licensed to provide P.E. services in multiple states, that perform the required engineering calculations to specify code compliant repairs and alterations.